This Improvised Explosive Device explosion sent Sgt. William Edwards on a journey from Iraq to Oklahoma, through Texas and across active duty and Reserve lines. Edwards’ convoy was on its way back to base Dec. 9, 2006, after a three day patrol, when those life changing flames engulfed his vehicle. With third degree burns covering 40 percent of his body, Edwards was returned stateside and admitted to Brooke Army Medical Center in San Antonio. Doctors used skin from his left forearm for a graft treatment, and his family and friends joined him at hospital, where he began to heal. While on convalescent leave, his friend and retired Marine Brendan Fitzgerald introduced him to Maj. Michael Purcell, Inspector and Instructor, Anti-Tank Training Co., based in Broken Arrow, Okla. Edwards offered his expertise to Purcell and was invited to work with the Anti-Tank Training Co. Marines. The opportunity paid dividends to both Edwards and the Broken Arrow Marines. Edwards organized the shop and set up procedures to simplify gear distribution during drill periods. He made sure the same equipment was being used in the same vehicles so Marines would instinctively know where everything was and how to use it. He also helped train the incoming communications chief and put all of his communications knowledge into binders as reference material. “I wanted to make his job easier, and I began to organize the communications shop in a manner that would allow future inspections to be less stressful,” said Edwards. Working in the communications shop at Broken Arrow also helped Edwards recover from his injuries. In addition to mental stimulus, Edwards began to push himself physically. Just nine months after the incident in Iraq, he completed a Marine Corps Physical Fitness Test. Since then, Edwards has begun running endurance events, including the Marine Corps Marathon. He decided to “just go for it” with the marathon after receiving encouragement from a friend who had also been injured in Iraq. Memories of his comrades who died in Iraq, motivated Edwards to finish the marathon. He later joined Team Semper Fi, a group of Marines injured in Iraq who compete in several different events, like marathons, to raise money for injured veterans. Edwards spends much of his time at Brooke Army Medical Center helping wounded warriors recover. Sgt Edwards: Part 4 of 4: Goals Attained! I told you about Sgt. Edward's life before the Corps. I explained about the Six Dog Tags that hang in his truck. I tried to help you to understand how important being a Marine is to Sgt. William "TJ" Edwards, the pride he feels in being one. Well, I am happy to report this outstanding news that I received late yesterday! In a moment that I am sure will forever be etched in the Sgt. 's mind, he was found "Fit For Duty!" What does that mean? After being burned over 45% of his body, December 9, 2006, TJ will remain in the Marine Corps. What does he have to say about it? Sgt. Edwards is a part of the change that has been occurring in the Marine Corps over the last several years. At one time, their policy was to discharge wounded Marines. Today, as a result of their change in thinking and policies, many Marines with severe injuries are now able to stay active duty with the Corps. Is this a good thing? One can’t help but agree with Sgt. Edwards on this as he explains why. This month the military has been in the news, with many profiles being done on our wounded warriors. Normally, these guys and gals stay in the shadows, preferring to concentrate on moving forward and doing what it takes to get the job done. They are not interested in pity. They are not hoping to make the headlines again. Been there, done that. They are interested in getting on with their lives, getting back to work. Moving forward and that is what they are doing! What do they ask from us? Not so much except to see them for the person they are, not for the injuries they have received. Look at their vibrancy, their will to push forward, their strength of character that challenges life at every step along the way. Congratulations Sgt. Edwards!! Job well done Marine! In Part 1, I left off right at the time of the explosion. “After my vehicle detonated that roadside bomb on December 9th, 2006; we lost Lt. Krissoff in the blast. Our driver of the Humvee was then Cpl. Pappas and his hand was severely burned. Our Platoon Commander, then Lt. Mayr walked away from the explosion without any burns, even though he was initially on fire. The gunner of our vehicle Cpl. Benevides, was launched approximately 50 ft. in the air and landed somehow without being injured. I was burned on 45% of my body.” They were taken to the nearest combat hospital once the scene was secured. That hospital was at Camp Taqaddum. Lt. Mayr and Cpl. Benevides were treated there at Camp Taqaddum, where they stayed for several days until they were able to rejoin their unit. Cpl. Pappas and Sgt. Edwards were also treated at Camp Taqaddum and later, were transported to Landstuhl in Germany. From Landstuhl they were sent to Brooke Army Medical Center (BAMC) in San Antonio, Texas. Brooke has advanced medical treatment for burn patients. I asked Sgt. Edwards, "Is there any one person who has had a major impact on your life? And why?” He replied, “Sorry, there is never just one person that has impacted my life.” I did find this out though. “Combat Correspondent LCpl. Laycock did an excellent job of portraying my story IED Victim Rebounds From Burns and recognizing several key individuals who supported me throughout my painful recovery. I would especially like to thank my mom, my sister, my aunt, Lisa Fitzgerald and Dakinah Sinkfield. The following Marines also warrant special recognition: MSgt. White, SSgt. Martinez, Hiram Frias and Brendan Fitzgerald because each one of them has been and continues to be an inspiration to me,” said Sgt. Edwards. Last year in December MSgt. White shared a photo with me. “Bear with me on this one, but I thought you would like to see the caliber of American that is out there today. I just read on a Marine blog how all hope was lost on humanity. This is proof that it isn't! Left in Dress Blues with a Purple Heart is Sgt William T. Edwards (call sign: Fast Eddie) (nickname: TJ). December 16th of 2006, he was patrolling the streets of Fallujah, Iraq with my old battalion. A routine patrol really. He had been awake for a while, so the platoon commander 1stLt Nathan Krissoff had him move to the backseat and took his seat in the front right of the armored hummer. As they were driving, an IED (Improvised Explosive Device) exploded next to their vehicle killing Lt Krissoff instantly. Sgt Edwards was engulfed in fire. His training and my nagging all those years kicked in, and he unconsciously rolled out of the vehicle and onto the ground. He had been wearing his protective gear (all of it, as my nagging had caused since he didn't want me standing on his grave saying "I told him to wear it".) He managed to roll most of the fire out before he was totally incoherent and medavac'd. “On my last tour to Iraq, my battalion lost a total of six Marines and four were critically injured. Those numbers included our attachments, and we were honored to serve with them. Sgt. Jonathan J. Simpson, 25, of Rockport, Texas, died Oct. 14, 2006. Cpl. Kyle W. Powell, 21, of Colorado Springs, Colo., died Nov. 4, 2006. Cpl. Jose A. Galvan, 22, of San Antonio, died Nov. 5, 2006. 1st Lt. Nathan M. Krissoff, 25, of Reno, Nev., died Dec. 9, 2006. Sgt. Gary S. Johnston, 21, of Windthorst, Texas, died Jan. 23, 2007. Cpl. Dustin J. Lee, 20, of Quitman, Miss., died March 21, 2007. I still think about those six men each day; and I am sure that every Marine and Navy Corpsman who deployed with us continues to do the same. In their memory, six dog tags hang under the rear view mirror in my truck; they are my daily reminders that "Freedom isn't free." observed Sgt. Edwards. Next: Sgt. William “TJ” Edwards – Part 3 Never Quit! He knew for years that he wanted to be a Marine, yet William Edwards ended up waiting until he was 25 years old before joining. Why the wait? Friends told him he would be making a mistake back in 1997 when he talked of joining the Marine Corps. So he spent some time exploring different areas looking for a career instead. College didn’t seem to be for him, so he tried his hand at retail management. While he was working his way up at Best Buy in Fredericksburg, Virginia he spent his spare time at the local motorcycle track near where his parents lived. His job there as a safety crew member was to assist the rider if a motorcycle crashed during a race. ”If a motorcycle crashed then it was my job to run up and get them back in the race or I would call a medevac in for them.” If he wasn’t doing that he was out playing rugby. Edwards worked his way up to the position of Home Theatre Department Supervisor at the store in Springfield, Virginia. Again, that was not all he spent his time doing. While there in Springfield, he volunteered as a Fire Fighter on his days off from Best Buy. “It was more rewarding than selling a TV to someone,” said William. He left Best Buy, but still didn’t head out to become a Marine. Instead he went to work at a motorcycle dealership, near where he lived. The military was again set on the back burner. Little did he know that this job would lead him to the Marines, through a friendship with a co-worker, Brendan Fitzgerald. Brendan was a First Sergeant in the Marine Corps Reserves. 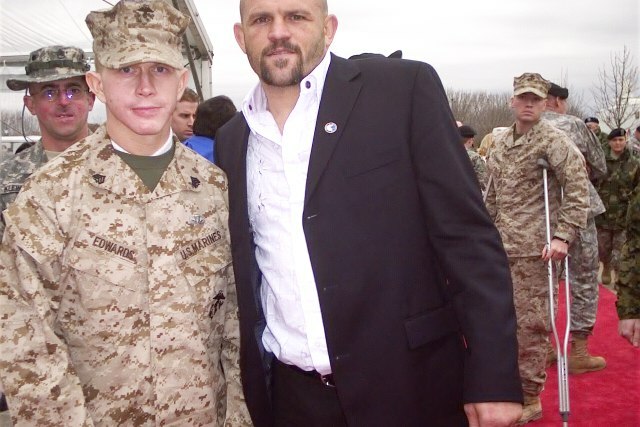 Over the course of many months, William talked with Brendan about his “aspirations to become a Marine.” Nearly a year later, after having a unique dream, William asked 1stSgt. Fitzgerald about enlisting. He then introduced him to a recruiter. What was the dream William Edwards had? “So I awoke that night and I vowed that the next day, I would talk to 1stSgt. Fitzgerald about enlisting. I did just that and he introduced me to a recruiter, that he to sign me up for the Marine Corps. I wanted to leave for Boot Camp as soon as possible. I did just that and within three weeks, I found myself face deep in some mud as I low crawled my way through the obstacle course with my Drill Instructors motivating me to go faster! It’s strange that four years later, I was inside of a hospital due to combat wounds. I almost died three times after that IED blast on December 9th, 2006. If it would have been my time to go, then I would have left this world in peace because I had earned my Eagle, Globe and Anchor and had become a United States Marine." Sgt. William “TJ” Edwards, a Marine, was serving with the 3rd Reconnaissance Battalion based out of Okinawa, Japan on his second deployment. That deployment started in September 2006 when they headed off to Iraq with a scheduled return in April 2007. On December 9, 2006 Capt. Mayr, Lt. Krissoff, Sgt. Pappas, Cpl. Benevides and Sgt. Edwards were in a convoy riding together in a Humvee on their way back to Camp Fallujah. They had been out on patrol for three days when a radio call from a vehicle near the front alerted them to a suspicious piece of metal off to the side of the road. At the same moment that Sgt. Edwards reached for the radio to respond to that call, their Humvee was engulfed in flames. An IED had been detonated as they passed along the road. Check back here tomorrow for the next installment on Sgt. William "TJ" Edwards - Part 2 Six Dog Tags. There has been a lot going on in the world and in our country. It is time to bring you up to speed on MSgt. 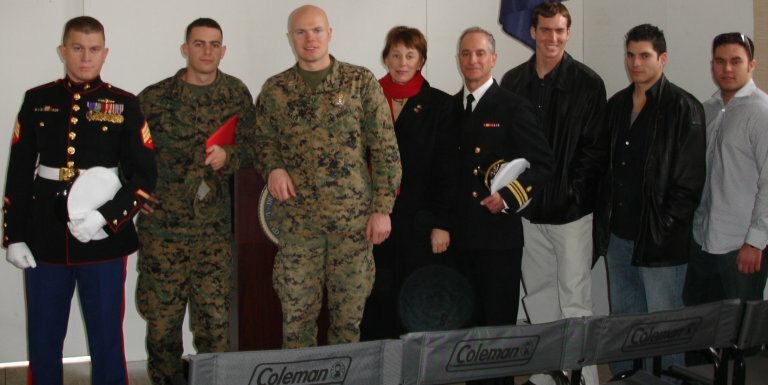 Jonathan White, his wife Peg, son Joshua and the rest of the story on the fund raising and their running of the Marine Corps Marathon October 26, 2008. I fired off a few questions to Jon, because I was sure I had several inaccuracies in my two previous posts about their run. Sure enough, I did, and the MSgt. was kind enough to point them out to me, for which I was grateful. I had the times completely wrong!! I also thought that Jon went to the NAPA convention by himself.....nope, wrong again. See what happens when I get excited and jump the gun on a story? Keeping the facts straight is a full time job. So here is the correct sequence of events, the who, what, where and when of it all. "NAPA was having a semi-annual convention to discuss the upcoming year. One of their family ran across the article YOU wrote and brought it to the attention of their Chairman and Staff. (This is a VERY Patriotic group of individuals) That’s when NAPA got the idea to support the Injured Marine Fund. It seems that Marines are not the only persistent people in this world. Mrs. Amy Feste was tasked with the job of tracking down and getting hold of the MSgt. "...Mrs Amy Feste went to extraordinary lengths to track me down. They had done a ton of research on Team Semper Fi and why we were running AND because there are a lot of veterans in the NAPA family." I originally thought that Jon had gone to Atlanta by himself, but after reading the updated comments on their donation page, I realized that perhaps all three had been there at the convention. "Peg and I went to Atlanta. I flew from 29 Palms in to D.C. at 0130 Friday morning while Peggy and Joshua landed at 1545 Thursday from Germany. 0800 we were on the Metro train to go to registration to pick up our bibs for the race. 1300 Joshua was being picked up from the hotel by his best friend (Joshua Todd) and his dad (which is my long time friend Nick Young). The two Joshs would catch up while Peg and I went to the Reagan Intl AP to catch an early flight.......which ended up being delayed so we landed in Atlanta and got to the hotel at 0100 Sat. 1000 Sat morning ( I got a Starbucks Coffee before we met the NAPA family. Between the Starbucks and the nice people of NAPA, the trip was well worth it!)" "1545 wearing a suit I might add, we went in and were greeted with a standing ovation that lasted forever." "I was nervous and did my best to represent the men and women that make up the target community of the Wounded Marine Fund. If this had been for me, I don’t know if I could have faced this audience. I just kept my mantra in my head, “God, please put the words in my mouth so I can represent these heroes and don’t let me embarrass them or my wife”. I wanted to know what he talked about. Did they have a topic picked out which they wanted you to address? "The theme was kind of left up to me, but they wanted to hear about the accident. 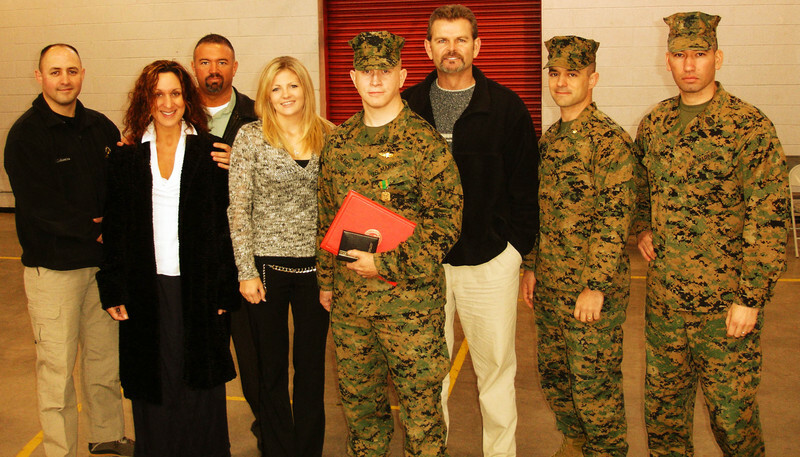 I got to tell them about the Corps, Team Semper Fi, and the Heroes that we want to help." "I made sure they understood that a wounded warrior doesn’t need pity, that’s not what we are about. In fact sometimes we need to hear some tough love like “Are you done feeling sorry for yourself yet?? ?” sounds cruel, but it is better then a 10 pound aspirin to a Marine." "Unless we are completely dead, we can come back from just about anything with the proper motivation." NAPA came through in a big way with their outstandingly generous donation to the Injured Marine Semper Fi fund. I had been thinking that the folks at NAPA were what Jon meant when he said "I have an Ace up my sleeve" and in a way they were. NAPA and all the other donors made for a terrific first marathon for Jon, Peg and Josh! Here are the "correct" times for their run, including Sgt. William "TJ" Edwards time. No matter who you are, it is often easy to spot a kindrid spirit when amongst strangers. This is very true I have been told of those in the military. When Jon and Peg were at the NAPA convention, he told me he met a large number of veterans from all branches of the service, many of whom were fellow Marines. When called a hero by a Marine who had served in Vietnam, Jon was uncomfortable with that, to the point of embarrassment. Why? ".....because his generation is my heroes..."
MSgt. White was correct in his belief that there are still Patriotic Americans out there! Many, many individuals stepped up to the plate and proved him right on that account! The donation site is still up and running, and donations are STILL coming in. If you didn't get a chance to donate, here is the link. Below are the links to previous stories we have done about the MSgt and his wife Peg. GySgt. White immediately began checking to see that all was fine as soon as his chute opened, and that’s when he realized all was not fine. In conclusion I would like to leave you with these thoughts from Peg. The Semper Fi Fund gives money to Marines and their families in whatever area the funds are most needed. It may be funds for a plane ticket so there is truly a familiar face. It could be money for a better cane…the Marine has what “works” but finds something that is better suited for him but not “approved”. Maybe the Marine moves home and needs access ramps put in. The funds are used for all sorts of things which help Marines and their families get through the tragedy and move on in the ways “they need” help. The Semper Fi Fund fills in the gap. All policies are general and cover most scenarios…but as we know…we are all unique and have individual needs. Our story could have been very different. This type of recovery is out of our hands and God has no limits. Plus…Jonathan is super hard headed! If Jonathan hadn’t recovered the way he did, I would have had to move us from Okinawa to someplace. I would have had all the medical support I needed but there would not have been allowances for ramps, vehicle modifications, community support, etc. The United States is our home but beyond that…we have no home. I would have just plopped us somewhere and we would have been the “family that moved in with the crippled guy”. I am not saying that we do not have families that wouldn’t have helped...but remember…we are hard headed. We are lucky. We have families. I know lots of Marines that do not have reliable families or they are the support for the family. Where do they go? And where do they get help from? The Semper Fi Fund for one. Jonathan and I have different views on his accident. He has to think of it as nothing big…and as the years go by and he does so well….I start to think of it as no big deal as well. When we meet Marines with “real” hardships and injuries, his seems small. The fact that his injury took place outside of the war zone makes Jonathan write it off as insignificant. In our world, war injuries are something to talk about. Jonathan has several Marines that have sustained multiple war injuries and are back in Iraq for their 4th or 5th tour. He will not diminish their sacrifice by putting any focus on his injury. If his story gets money for those war heroes, then and only then is it worth telling. Jonathan and I are just regular people doing regular old things. Life throws us obstacles and we deal with them as best we can. So much good has come to us since his accident……we have met so many great people, been able to help others, and as a family grown closer….it has almost been a good thing. I want to say thanks here to Peg and Jonathan for all they do, for reaching out to others. A special thanks to them both for their service to our country through the Marine Corps! Best wishes for a successful run in October! I don’t think I ever got around to talking about one of my main questions. Why do you think Jonathan decided to run in a marathon? Why not pick a shorter race? Is there a special significance to a marathon? Peg was describing her training to me. Somehow I don’t think Peg is going to have to worry about her figure come October. You don’t see many if any, marathon runners who are carrying extra weight around with them, unless it is a fanny pack of food/water! I got the impression that a daily date at the gym was not a normal part of Peg’s routine, prior to this past April. In fact she describes her feelings about going to the gym quite clearly. I would say that is quite a turnaround in attitude! I wondered where she gets the time to do all this training. After all she is a full time Mom with 3 kids, all quite active with their own activities, and you just know she is doing a lot of volunteer work there at the base. I wondered if she was working outside the home? And if so, when does she actually meet Jonathan for their run/walks. Peg mentioned that they are mostly on the track at the same time, but she is walk/running while he is running. Well she let something slip in an email to me last week. It seems her training is really starting to pay off these days. Way to go Peg!! I would not be at all surprised to hear that Peg has been able to run at least half the marathon side by side with Jonathan! We have pretty well covered the training, running, walking, eating, shoe buying areas, but I need to clear up a misunderstanding I personally had here. While I was shocked to see Jonathan entered into the marathon, given the history of his back and all, I was pretty surprised that there were not more donations showing up. I thought, what the heck, they know people all over the world. What is up with that? So rather than guess, I asked. That always seems to be the best way to find out information, in my book. That makes sense. What I don’t understand is how come the readers here are not kicking in a few bucks? Don’t just say money is tight! It is for all of us, but that doesn’t stop the bullets and IED’s from injuring our Marines, or prevent the burns and broken limbs from happening does it? No! Each and every day there are Marines that lay it all on the line for our freedoms! So that you and I can go to bed at night in peace! This isn’t about politics either! Bullets and explosions don’t care about whether you are a Republican or Democrat, rich or poor, black or white, man or woman! Now are you really going to tell me you can’t even afford $5 to help a Marine, who would go without rather than ask for help?? Trust me! It is a rare person in the military, any branch that will easily walk into a place and say, “I need some help! I know that, from dealing with soldiers/Marines/sailors/airmen for the past 3 years! Stubborn, hard headed, determined, but most of all it is their PRIDE! So I am doing it for them! I am doing what I can, even though it isn’t much, but I am trying to give Peg and Jonathan’s Fundraiser as much visibility as I can in hopes that others will donate. Be an anonymous donor! I don’t care! They don’t care! Step up to the plate, for those who have given so much and asked for nothing!! In Part 5 I am going to wrap things up. Peg has made a very strong case why the Semper Fi Fund would be a good organization to donate to. I am going to share those thoughts with you. I intend to wrap up this series tomorrow. I will touch on how strength grows out of adversity! How miracles do occur! See you then! You get to the mall and there are no less than 3 specialty shoe shops for women, plus 4 that sell nothing but athletic shoes, and of course there are the shoe departments within the big stores that also sell shoes. Plenty of places to choose from, and if you are hard to fit, there are sure to be some smaller independent stores nearby to check out. So where did Peg find her shoes? Today, Peg is doing something entirely different. She is training for a marathon. A race she has never before attempted. In fact, she has never entered a race of any length prior to this. She will go from being a non-runner to running a marathon in 6 months time. To run for 26.2 miles in your first race is pretty amazing. Let’s look back at why Peg chose to join the Marines. I think that tells us a lot about her ability to succeed in her quest to raise funds for the Semper Fi Fund. If you stop and think about it, being a fit Marine doesn’t guarantee you to be able to run a marathon. Our bodies are just not made to run that far. There is a point in every marathoner’s run when they hit “the wall” so to speak. It usually occurs around mile 20 or 22. At that point in the race, it is sheer grit carrying you forward, step by step towards that finish line. A finish line that is still another 4 to 6 miles away! In some ways, Peg’s Marine Corps training has helped her though. “My last day of service was 7 Jan 1994. I served my 4 year contract and then got out on my EAS (End of Active Service date). I am training now far more than I ever did while on active duty. I have always been good at pushing myself. While on runs, I think about boot camp, force marches, etc….I remember well doing starjumps, pushups, etc because someone was too slow, or forgot something, or said the wrong thing…..then I am thankful that all I have to do is run….and I can run at my pace. Obviously, if you are running 7 miles a day, and working towards 26 miles, you are going to have to make some changes in your diet. Your body demands a few things to keep it happy and in good running order. Proper nutrition, proper shoes, clothing to run in all different types of weather, these are but a few of the things to consider. You need to set a schedule of how many miles to run each day, each week, and what about other types of exercise. Yes, you need to do more than just run. Peg and Jonathan spend time each week on weight training also. As for words to the wise on eating, I do believe Peg has some very good advice. This advice works for anyone, whether they are in training for a race, or just going about their everyday life. Yikes! It never even occurred to me that you might have to use the bathroom along the way! Here you are running and sweating like crazy, so you naturally are chugging fluids…… Perhaps this is where that “intestinal fortitude” comes into play. Good luck with that one Peg!! In part 3 of the series, I will delve into the difficulties of getting the right shoes for the job and just exactly “why” she decided to run with Jonathan (is she?) rather than cheer and support him from the sidelines. Running TO Live - Running for Others. It doesn’t calculate in the miles he’ll run preparing for the big day. It doesn’t calculate in the value of that first step he took in recovery. He isn’t getting a dime of the donations. He’s asking for nothing for himself. Like a true NCO, he’s asking you to help his Marines. Marines he hasn’t met. Marines he has. Marines that have been wounded in Service to this Nation. Marines that have been injured defending YOUR freedoms and bringing Security to the World, most notably in Iraq and Afghanistan. Recovery? Yes, it was not too long ago that the Doctors thought he would never walk again. But he is a Marine. "The difficult we do right away. The impossible may take a day or two." He refused to be confined to a wheelchair. He fought to get out of it as hard as he would fight those that would do this Nation harm. And he has been successful. He’s running now in preparation for the Marathon. On 23 July 2003, a Military Parachuting accident caused a spinal injury but with the work of CMDR Robert Rosenbaum and a LOT of hard work, he overcame the adversity presented him. But what of me up here on my bully pulpit preaching Support of Our Troops and asking YOU to give to a worthy cause? Well, to be honest I’m a bit disappointed in my results so far. Since my first call to action, there has been only $275 added to the contributions. But we have put our money where our mouth is. All proceeds earned from advertising on this page during the month of June is pledged to this effort. That means if you buy during June a book from either WOTN Store-1 WOTN Store-2, if you buy a Kindle here that’ll add more to his efforts, if you buy a t-shirt from Ranger Up here, it’ll contribute to the fund. Anything you buy from the links on this page (right side) including tools, flowers, appliances, lights and office products, will also contribute to his goals for the Semper Fi Fund. But what of last month? What have we already done? Last month we earned $7.24 but we won’t let that hold back our efforts. $100.00 was donated to the Semper Fi Fund and $50.00 was donated to the Fisher House. 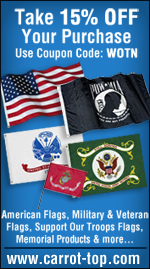 Additionally, Ranger Up donated funds to the Wounded Warriors Project through purchases here. Is this meant to brag? No, not in the least, but you deserve to know that our claims are not empty. We pledged to donate at least 10% but up to 100% of all funds earned here. We paid out 20x that which we achieved. 100% of June Proceeds are pledged to Semper Fi Fund. Since basically no one knows who I am, I can brag of these efforts without fear that y’all will give undue praise for it. So do a little something for the troops. Please donate $26.20, one dollar a mile, to Semper Fi Fund. Perhaps, you can afford $2/mile, $52.40 or $4/mile, $104.80 but surely you can afford $26.20. It’ll go further that way than if you buy something, though buying something will also help. And who knows, if you buy your wife/girlfriend some FTD flowers, it might just get you out of trouble too! War on Terror News©2008, ARM, all rights reserved. Who is Peg White? Some might call her Mom, a Marine, a wife. They would be correct, in part. That is just a small glimpse of who Peg really is. Determined is another word that fits. She doesn’t quit when the going is tough! In fact, I don’t think the word “quit” is in the vocabulary of a Marine! She and Jonathan are determined to raise money for the Semper Fi Fund! Not just a few bucks, but a minimum of $5,000 with an ultimate goal of $26,200. Much has been written about Jonathan. I wanted to hear from Peg what her thoughts were; after all, her name is right there next to Jonathan’s on the donation site. I couldn’t pick up the phone and call her; she is overseas. So I sent her a list of questions. She agreed to answer them for me. You will find Peg’s answers, in her own words, after each of my questions. The bottom line here is getting the donations for the Semper Fi Fund. So you don't mind sharing the personal side of Jonathan's injury and background as a means to hopefully bring in more donations? It is hard to not bring Jonathan's injury to the front when talking about his run and fundraising for the Semper Fi Fund. He is a living, running example to what great medical care, a great support system and the power of prayer can do, wouldn't you say? I would say that. In our minds….this may be the reason it happened to him. We do not presume to understand the master plan…we just acknowledge that there is one. Through the experience…even back to Balboa….many positive changes resulted from this injury. My letter to the Admiral was in the hopes that no family would suffer as we did and I know that they did not. My hope in this case is that we can donate substantial funds to help many Marines and their families that need it. Is Balboa a medical center where Jonathan had his surgery done? Balboa is a medical center for Marines and Navy personnel. We get sent to Tripler in Hawaii, Balboa in San Diego, or Bethesda in D.C. Those are the three primary facilities for us although we do get treatment in other branches facilities if absolutely necessary. I am sure there have been many improvements in regards to that as well….at least I hope so. Hopefully, those that get injured get sent to where the best care is available first and then something close to home. To answer your question…yes, it is where his secondary surgery took place. Would you like to tell us anything about Jonathan’s accident? How it affected you, the family, and how far he has come in the past five years? Jonathan’s accident has taught us so much. We changed the way we were living…and now we actually “live”. Prior to the accident, Jonathan and I worked like crazy. Now, we spend more time together and with the kids. We started taking vacations which we had never had time for before. We try to take every opportunity that comes around to give back or help those that are injured. Before we donated funds, etc…but now we really pay attention. The squeaky wheels are getting the grease. These fallen heroes often times cannot speak for themselves, are too new to the system to know any better, or have civilian family members that are just ignorant. It is funny how Jonathan has recovered too much. People are strange. They pray for full recovery and wish it, but there is unspoken line that you are not supposed to cross. Jonathan crossed it along time ago. Once you cross that line….then everyone thinks that the injury could not have been that bad to begin with. That is what bothers me the most. For me, I have Jonathan making the injury smaller than it was/is and then others doing the same thing. In Part Two you will read about why Peg joined the Corps and what her thoughts were when she found out Jonathan had decided to run in the Marine Corps Marathon.